Like the old vaudevillian said, words that start with the letter "P" are funny; and words with "K" are funny. If that′s the criteria, then the word "pumpkin" should be a riot. And, actually, it is. Pumpkin just isn′t a serious word. It′s used as a pet name -- an endearment often further cutesyfied as "punkin′". And in our culture anyway, the pumpkin is more associated with the fanciful, like jack-o-lanterns and Cinderella coaches, than the sedate. Unless, of course, you don′t count the rather grim domestic situation of Peter Peter Pumpkin Eater. Mother Goose recounts that Peter "had a wife and couldn′t keep her" until he imprisoned her in a pumpkin shell ("and there he kept her very well"). I have no intention of discussing varieties or exploring the origin of the word, going back to the Greek or Latin or any of that etymological nonsense. I prefer to stick with the fun part and, specifically, the delicious aspect of pumpkins. Actually, it′s probably the physical characteristics that pumpkins possess which have inspired humanity to find so many imaginative uses for them. They′re roundish, they′re hollow, and they are quite orange. In short, pumpkins absolutely beg us to do things with them. 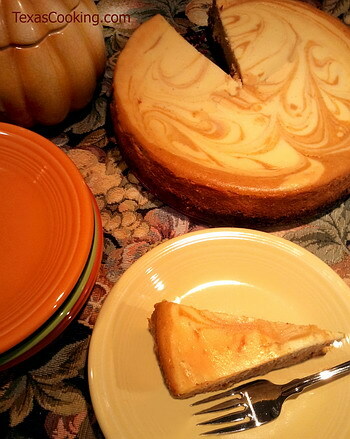 We oblige by sharing with you recipes for a delicious Pumpkin Bread, the hearty but elegant Creamy Pumpkin Vegetable Soup, a darkly delicious Pumpkin Pecan Pie, the delectable Pumpkin Marble Cheesecake and, finally, Pumpkin Flan. But before we get to that, let′s make sure everyone knows how to prepare pumpkin purée, the key ingredient in each of these recipes. Now, I′m going to assume that everyone knows not to bother with trying to cook the jack-o-lantern giants. These varieties are bred for size only, and any attempt to purée their innards is largely a waste of time. Although many pumpkins are grown in Texas, Morton, Illinois bills itself Pumpkin Capital of the World and, indeed, the Libby pumpkin cannery is located there. Incidentally, Libby Solid Pack Pumpkin is an excellent product. The smaller can size is 15 ounces, just right for their fine pumpkin pie recipe on the label. One of these cans will serve very well in any of the recipes in this article that calls for two cups of pumpkin purée, even if it is one ounce shy of two cups. After you have learned how to make pumpkin purée, decide whether it′s worth what you pay at the supermarket for the Libby product. Among the best, meatiest, sweetest and tastiest of the pumpkins are the small Sugar pumpkins found in supermarkets, called "pie pumpkins" Among the best, meatiest, sweetest and tastiest of the pumpkins are the small Sugar pumpkins found in supermarkets. They are usually called "pie pumpkins" and are kept apart from and priced differently than the jack-o-lantern candidates that your kids are eyeing. Cut a pumpkin in half crosswise and remove the seeds and stringy fibrous material. Cover the cut side of each half with aluminum foil, and place the pumpkin halves on a baking sheet, foil side up. Bake in a preheated 350°F oven for about 90 minutes, or until the flesh is fork tender. Remove from the oven and cool. When the pumpkin is cool enough to handle, scoop out the meat and mash in a food processor, or force it through a food mill or sieve. If the purée is watery, drain it in a cheesecloth-lined collander. Pumpkins yield about one cup of purée per pound (3 lb. pumpkin = 3 cups purée). That′s all there is to it. Okay, now let′s get on with the recipes. Recipes for Pumpkin Bread are easy to find, but this is one of the best I′ve ever tasted. Moist, but not falling apart, sweet, but not too sweet, and redolent with spices. It also freezes very well. In a large bowl, stir together flour, brown sugar, baking powder, baking soda, salt, cinnamon, ginger, cloves, nutmeg and orange peel. In a second bowl, combine pumpkin, butter, oil, eggs and molasses. Make a well in center of dry ingredients; add pumpkin mixture and stir just until mixture is combined and dry ingredients are incorporated. Stir in the pecans. Divide batter between two greased and floured 9x5x3-inch loaf pans. Bake at 350°F for 1 hour or until a toothpick inserted in center comes out clean. Cool in pans for 10 minutes; then turn out on wire racks. Makes 2 loaves. Grease two muffin tins (or use vegetable cooking spray). Fill muffin cups 2/3′s full. Bake in a preheated 400° oven for 20 to 25 minutes, or until a toothpick inserted in center comes out clean. Cool in tins for 5 minutes; then turn out muffins on wire racks. Makes 20 to 24 muffins. This recipe can be varied by adding 1/2 to 1 cup of raisins, chopped dates, prunes or apricots. Honey can be substituted for the molasses. In a heavy saucepan over medium-low heat, sauté the chopped onion and leeks until onion is transparent. Stir in pumpkin, potato, tomatoes and chicken stock, salt, pepper and Tabasco sauce. Add chopped celery leaves and parsley. Cover and simmer for 30 minutes. Remove from heat. Vegetables should be tender. Allow to cool somewhat. Process soup in a blender or food processor, in batches if necessary, until soup is puréed. Return the soup to the saucepan and bring to a simmer for about 10 minutes. Add the cream and butter and continue heating, but do not allow it to boil. Makes about 8 servings. Oddly enough, your old blender will give you a smoother result here than your fancy-schmancy food processor. Garnish this excellent soup with homemade croutons or serve with a hot dark bread. If you, like me, get excited about pies, this is one for you. The flavor combination is excellent and, somehow, the marriage of pumpkin and pecans is perfect for the holiday table. Regardless of when you bake it, your house will smell like Christmas morning. Combine 1 egg, pumpkin, 1/3 cup sugar, cream, cinnamon, nutmeg and ginger. Spread gently over bottom of unbaked pie shell. Combine 2 eggs, corn syrup, 1/2 cup sugar, butter and vanilla. Stir in pecans. Spoon carefully over pecan layer in pie shell. Bake in 375°F oven for 50 to 55 minutes. Top layer (pecan layer) will puff up when done, but settle back down as pie cools. Combine gingersnap crumbs, pecans and butter. Press onto bottom and 1-1/2 inches up sides of a 9-inch springform pan. Bake for 10 minutes in 350°F oven. Remove and allow to cool. Combine cream cheese, 2/3 cup sugar and vanilla, mixing at medium speed on electric mixer until well blended. Add eggs, one at a time, beating well after each addition. Remove and set aside 1 cup batter, and chill. Add remaining sugar, pumpkin and spices to remaining batter; mix well. Alternately layer pumpkin and cream cheese batters over the gingersnap crust. Cut through layers of batter with a knife several times to achieve marble effect. Bake for 1 hour and 15 minutes. Loosen cake from rim of pan; cool before removing rim of pan. Chill before serving. Make a hot water bath for the flan by setting a 9-inch cake pan or deep-dish pie pan in a larger pan. While holding down metal pie or cake pan so it won′t float, fill outer pan with just enough hot water to come up around the smaller pan. Then remove the smaller pan and put the larger pan of water in a preheating 350°F oven while you mix the flan. Melt the 1/3 cup sugar directly in the pie or cake pan the flan will be baked in. To melt evenly, hold the pan securely (wear a good oven mitt or use tongs) over or just resting on a burner; shake and tilt the pan, rather than stirring the sugar. Watch carefully. Once melted, sugar will caramelize (brown) quickly; as soon as it does, tilt pan so that the entire surface is covered. Remove from heat; syrup will harden, but that′s okay. Beat together eggs and the 3/4 cup sugar; add the salt, water, cinnamon, vanilla, pumpkin and milk. Set caramel-lined pan in hot water in oven; pour in egg mixture carefully. Bake in a 350°F oven for about 25 minutes; test doneness by gently pushing custard in center with back of a spoon -- when done, a crevice about 3/8 inch deep forms. Remove from hot water and chill at once. As the flan cools, caramel dissolves. When cold, loosen custard edge with a knife, then cover with a rimmed serving plate. Holding plate in place, quickly invert. The flan will slowly slip free and the caramel sauce flow out. To serve, cut in wedges, spoon on sauce. Makes about 6 servings. There are so many wonderful dishes to be created from pumpkins, but we must not overlook their nutritional benefits. One cup of purée contains only about 80 calories and is low in fat (1 gram). Pumpkins are additionally valuable for their beta-carotene, iron, riboflavin and trace minerals. And, as we have discussed, pumpkins are a lot of fun. Save the pumpkins seeds from the jack-o-lantern this year and toast them. Wash the sticky juice off the seeds and dry them. For every cup of seeds, melt a tablespoon of butter in a flat pan with an edge, like a jelly roll pan, add the seeds and shake the pan to coat with butter. Place the pan in a 425°F oven and toast for 20 minutes until light brown, stirring occasionally. Allow to cool before eating. October activities afford many opportunities for pumpkin inspiration. So unleash your imagination. Even if you go only as far as picking up a can of Libby′s Solid Pack Pumpkin, we have given you at least five ways you can put it to good use. Each of the recipes is in Grandma′s Cookbook on the TexasCooking.com website.